Chronic Telogen Effluvium, also known as Diffuse Hair Loss, predominantly affects women but can also appear in men. It can be caused by a lack of certain nutrients or as a side effect of illnesses including anaemia and thyroid conditions. However, another common trigger of this persistent hair loss condition is stress. This can be stress in the form of a sudden shock or trauma, including emotional stresses such as divorce or a bereavement. It can also be due to prolonged stresses like the pressure of work or family life. Both these types of stress can cause Chronic Telogen Effluvium, which displays as thinning hair all over the scalp and lasts for six months or more – in some cases this can appear gradually over a number of years. However, it is possible to treat this type of Diffuse Hair Loss. Whilst Acute Telogen Effluvium can be triggered by an isolated incidence of extreme shock, sudden occurrences with longer-term emotional repercussions – for instance, the loss of a loved one through death or divorce – may also set off Chronic Telogen Effluvium (example pictured right, click the image to see this Belgravia client’s Hair Loss Success Story images before and during treatment). 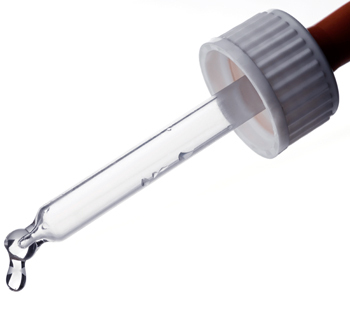 It is believed that the trigger incident may cause a shut-down in hair production temporarily, but the on-going stress associated with the initial event can bring about the more persistent version of this hair loss condition. Stress causes the body to enter its ‘fight or flight’ mode. This natural, physiological response puts the body in a state of high alert – tense and ready to spring into action when it perceives any form of danger or potential threat. This causes the release of certain hormones into the blood stream, including cortisol, noradrenaline and adrenaline. As the body stands by, primed for an ‘attack’, these hormones suppress the immune system, increasing blood pressure and blood sugar, in order to produce the rush of energy needed for physical defence. Some of the effects of these reactions include a quicker pulse, rapid breathing, and constriction of blood vessels around the body. Other changes provide the body with the strength and speed it may require to ‘fight’ or take ‘flight’, with perhaps the most relevant to hair loss being the diversion of blood flow away from some parts of the body in order to increase blood delivery to the muscles. It is thought that this blood flow diversion away from the scalp can cause a number of hair follicles spread diffusely across the scalp, to prematurely enter the telogen (resting) phase of the hair growth cycle at the same time. This then results in noticeably increased shedding around one-to-six months after the stress became unmanageable. In small, occasional bursts, the ‘fight or flight’ response is of little concern to hair production, however, should it become prolonged, for instance, in those who have on-going, untreated stress concerns, the chemicals this response creates can build up within the body. When a person is under intense levels of constant physiological stress, this can lead to a debilitating condition that causes chronic suppression of the immune system as well as hair loss. Whilst proof of the precise human response has not yet been determined, it is understood that this type of stress manages to change the chemistry of the hair follicles, again, prompting a number of them to suddenly enter the telogen phase. Despite a lack of human trial results, scientific animal studies have shown that stress can trigger the catagen phase of the growth cycle in mice. 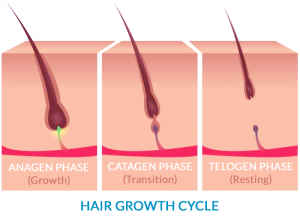 This phase is the short transition stage that lasts two-to-three weeks and follows the anagen (growth) phase, indicating the end of the active growth of a hair. In order to treat Chronic Telogen Effluvium – or any stress-related hair loss – it is necessary to first deal with the underlying cause. Dealing with the source of the stress, whether this is through relaxation techniques, exercise, changing jobs, going to counselling/therapy, or by seeking medical assistance, should combat the cause of the shedding, allowing the focus to switch to how best to regrow lost hair. Treatment also helps to minimise the damage that can be done to hair growth whilst the body goes through crisis. Once the cause of the stress is under control, the hair will generally right itself and start to regrow, however this can take around six months. It is possible to use minoxidil – the hair loss treatment medically-proven to treat both female and male pattern hair loss – to help spur the hair follicles into production, helping to boost natural hair production. Many Belgravia clients who have come to us for Diffuse Hair Loss treatment have been amazed at the results they have experienced by using a comprehensive hair loss treatment plan featuring minoxidil formulations. Prepared in our Belgravia Centre in-clinic pharmacies, our high strength minoxidil has been used to great effect by many Chronic Telogen Effluvium patients, some of whom can be seen below. If you would like to know more about our minoxidil, please send us a message or call the clinic on 020 7730 6666. For more information regarding Chronic Telogen Effluvium, or Chronic Telogen Effluvium Treatment, please click the relevant buttons below. Below you will find a selection of just a few of the clients we have treated here at Belgravia for hair loss from Chronic Telogen Effluvium. If you click on the individual images you will be able to see each person’s full treatment progress pictures, alongside their review and thoughts about their experience with us. You can find more examples in our Hair Loss Success Stories gallery which is updated regularly and features over 1,000 patients’ testimonials and images.